Baseball and hot dogs bring back fond memories to many of us. For me it's a day at Fenway with my Dad and a hot dog with mustard. I can taste it just sitting here thinking about it. It was a simpler time and the only way to go back there is by closing my eyes and tasting that unforgettable taste. That is why having a hot dog joint is such a great thing to do. Almost everyone that comes through the door has a memorable hot dog experience. Those memories usually take one back to a pleasant time. Often our customers share those memories with us. It's the best part of the job. Anyway, Yank's Franks is beginning to add a baseball theme to our "joint." 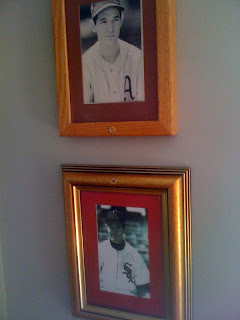 What better way than to hang photos of the original "Yank." 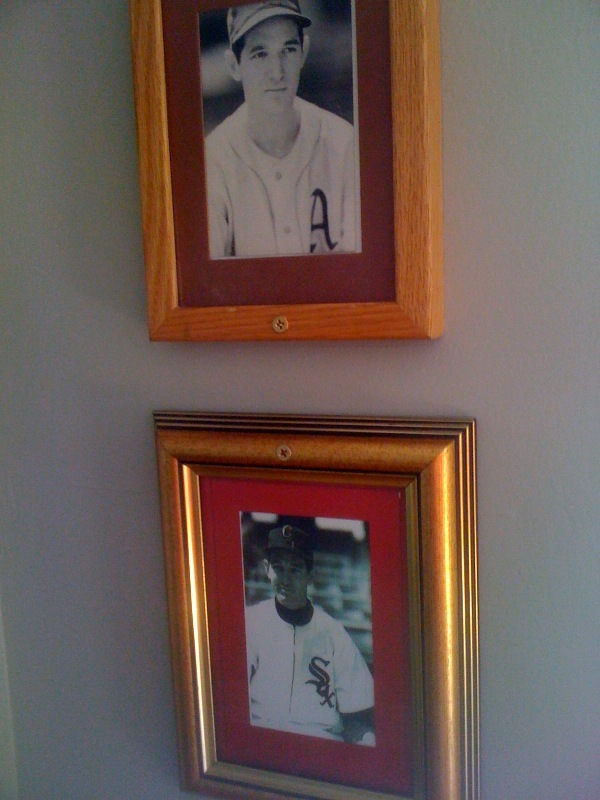 The top photo is Yank in his Philadelphia Athletics uniform in 1942 and below he is in his Chicago White Sox uniform in 1949. In between 1942 and 1949 was WWII, Northeastern University and minor league baseball. 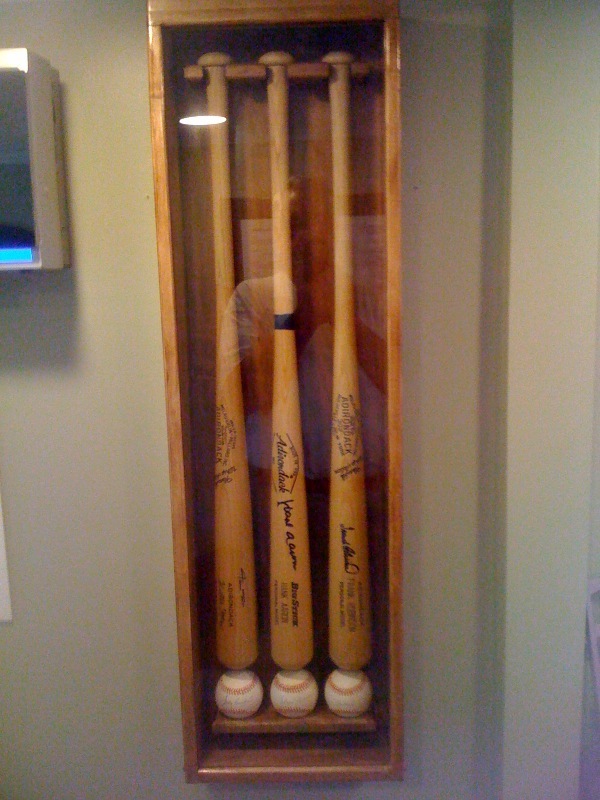 Oh, and the bats and balls above have authentic signatures of Hank Aaron, Willie Mays, Sandy Koufax, Frank Robinson and Cal Ripken, Jr. Frankly, there is nothing more All-American than baseball and hot dogs! 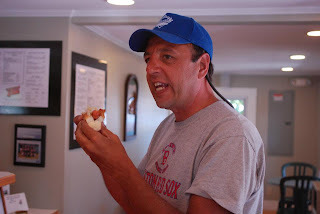 ...and The Hot Dog Man is traveling New England and stopping at a different hot dog joint each day. 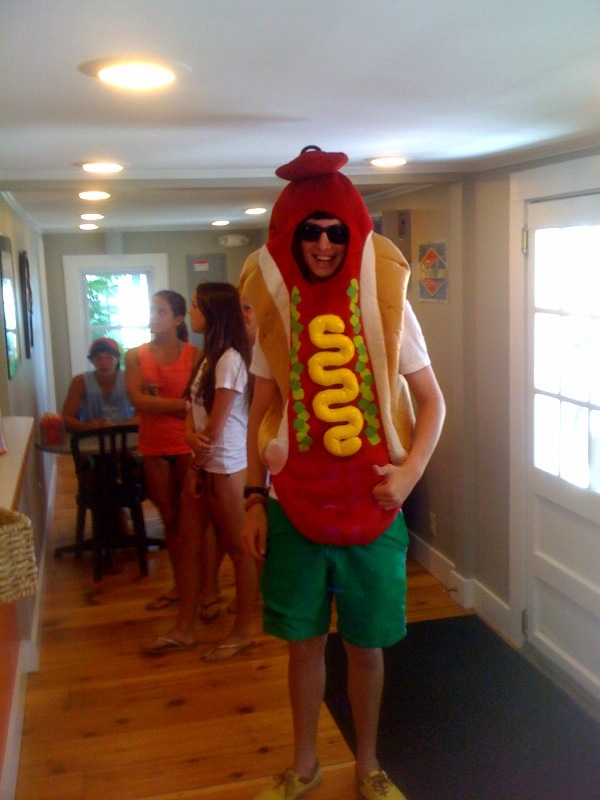 The question remains, did he pick July because it means 31 hot dogs (instead of getting gypped with a tiny month like February) or is it really because July is National Hot Dog Month? 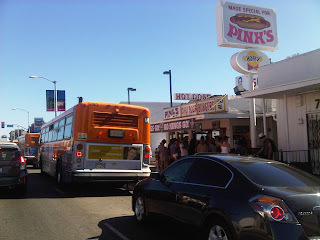 It doesn't matter because he is on the move and day 12 (July 12th) he stopped at Yank's Franks. Last year The Hot Dog Man chowed down on a Yank's Frank. 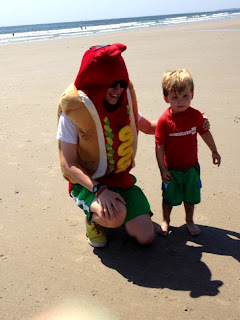 This year, at the suggestion of Hot Diggity, he tried the Wells Beach Dog. He has a new favorite. I think it was the Applewood-Smoked Bacon that got him. Frankly, It Was Great To See The Hot Dog Man (and Drew, the videographer)! The Traveling Yank's Frank made his debut today at Drakes Island Beach. He handed out coupons to hot dog lovers of every age. Even our Traveling Yank's Frank gets hungry. 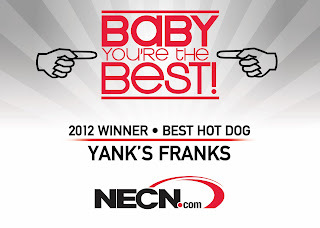 When he does, you know where he eats...Yank's Franks! Notice the Relish Green shorts and special kudos for the Mustard Yellow sneakers. Frankly, does anyone know of a better Traveling Hot Dog? No chance! 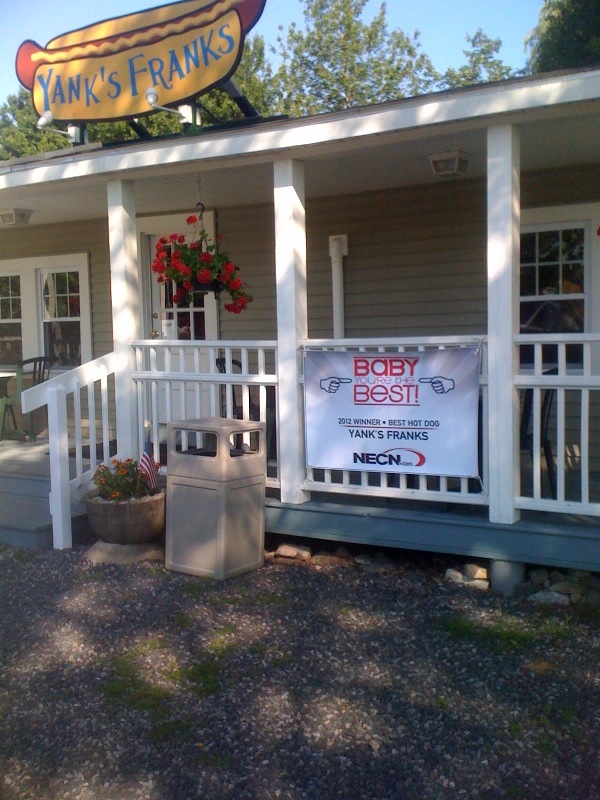 This morning we were so happy to add this banner to the front of Yank's Franks. Once again, thanks everyone for your votes!!! Frankly, I Really Like The New Banner! Great news for Yank's Franks! 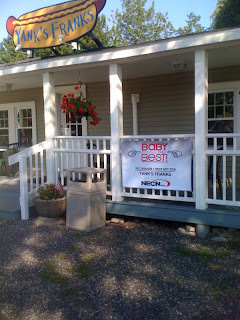 Check out the piece that was run on NECN this morning. 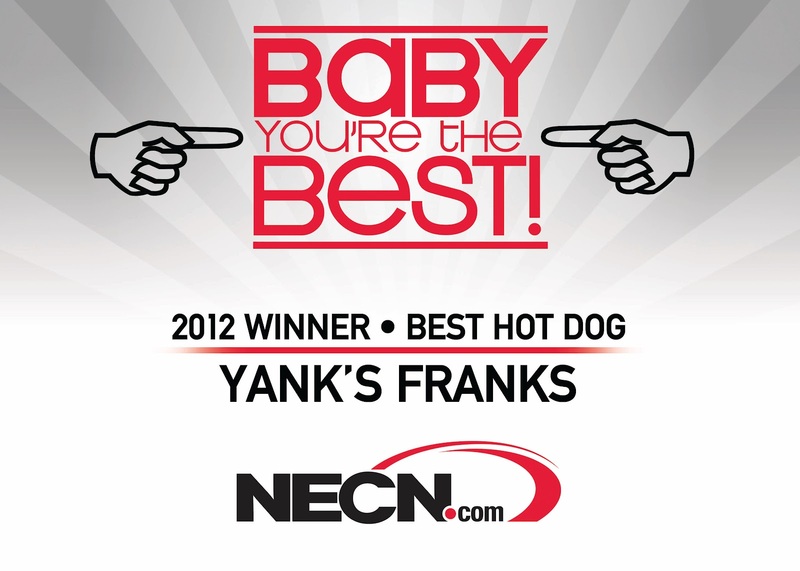 Thanks to all who voted for Yank's Franks. 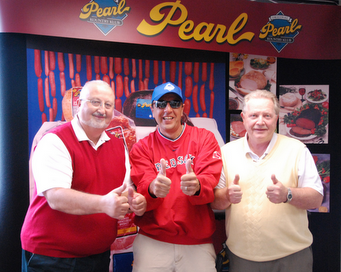 Frankly, Yank's Franks has the BEST customers and the BEST friends!! !